Get excited, Wicker Park residents: A new neighborhood pizza joint is opening tomorrow-- and it's a good one! This weekend I got the chance to preview the menu at the new Craft Pizza in Wicker Park and I am so excited to tell you more about it! Craft Pizza is the second pizza restaurant from the creators of the already successful Pizzeria Serio in the Lakeview neighborhood. This new Wicker Park restaurant is super casual and perfect for a laidback meal, takeout, or a quick slice on the go. 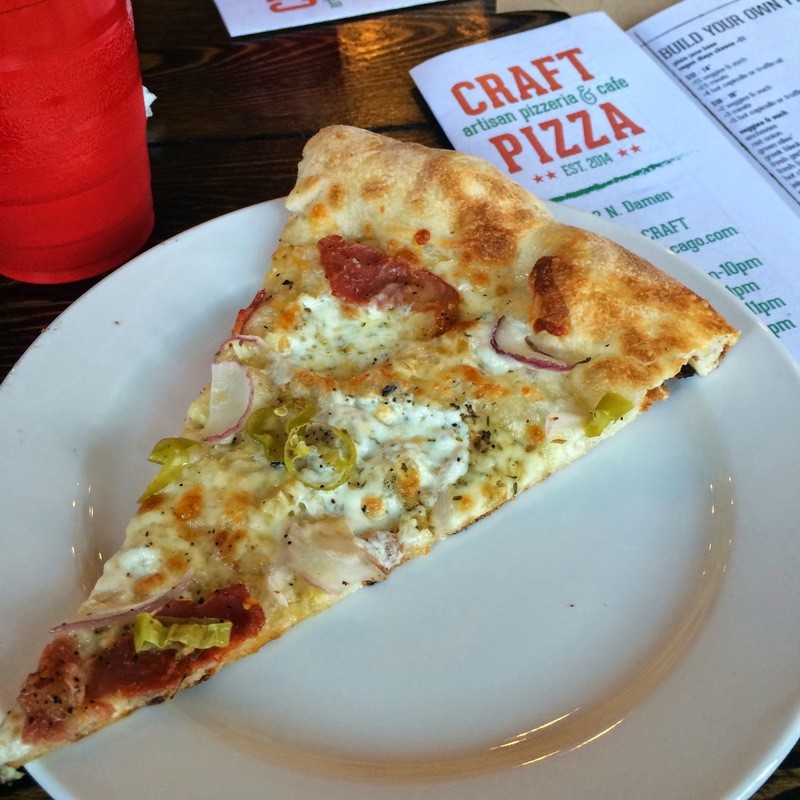 And unlike most casual carry out-friendly pizza joints, Craft Pizza's menu is interesting and diverse and the pizza is made with quality ingredients. And it was delicious! The menu at Craft Pizza offers a variety of pizza flavor combinations-- from the classic Margherita pizza to the more creative like the White Truffle Pie topped with a cheesy blend of fresh mozzarella, Pecorino Romano, Grana Padano, truffle oil, and sea salt. The White Truffle Pie happened to be one of the best pizzas that I tried that night. The simple combination of a few different and high quality cheese with rich and flavorful truffle oil was just perfect. In fact, it was so good and I was so excited to try it that I forgot to snap a photo! The Craft Margherita was definitely not to be overlooked. It was made with fresh and simple ingredients, which all really shined here. I love that they went traditional Old World Italian with the sauce here-- it's super simple with fresh tomato flavor. And speaking of Old World Italian, the crust on all of their pizzas is hand tossed in the classic Neapolitan style. The crust is thin and crunchy on the outside, but chewy on the inside. 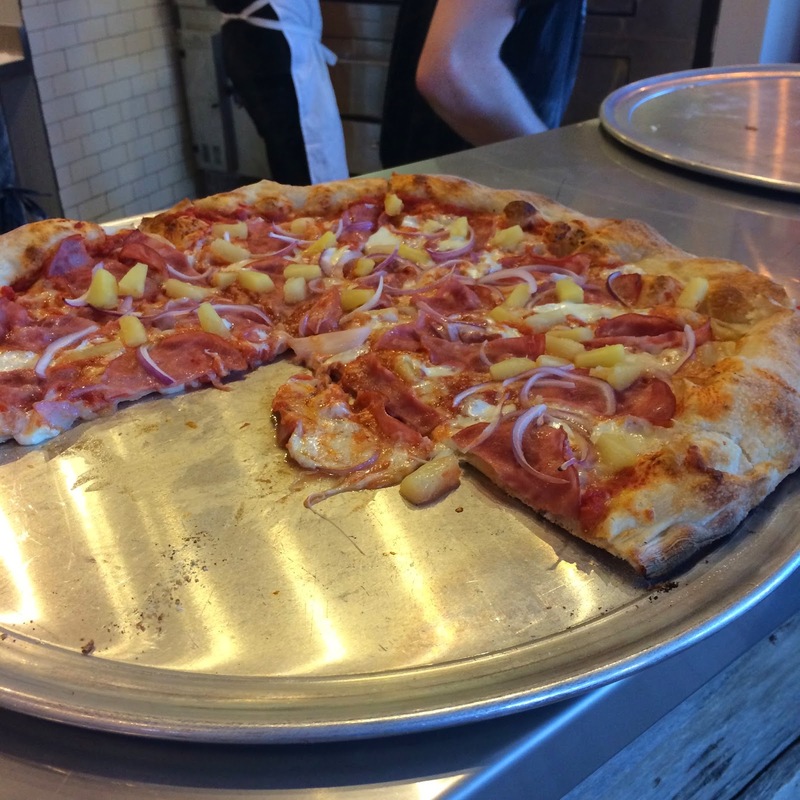 In speaking with the owner, we found out that he had spent a good amount of time experimenting and perfecting this dough recipe to not only make it tasty, but to also make it a little different from the kind of pizza crust you would see at Pizzeria Serio. At Craft you have the option to customize your own pizza, but there are some other house pizzas of note that I would mention too: Another favorite of mine (and Alex's hands down favorite of the night) was the super spicy and cleverly named Devil in the White City. This white pizza was topped generously with a blend of cheeses, garlic, and seasoning along with spicy capicollo, hot cherry peppers, pepperoncini, and red onions. It's available with red sauce too, but we loved the super spicy toppings on a simple white pizza. And for another cleverly named pizza, try the Wicker Pork! Cute, right? It's Craft's version of a Hawaiian pizza topped with smoked Canadian bacon, red onions, and pineapple. 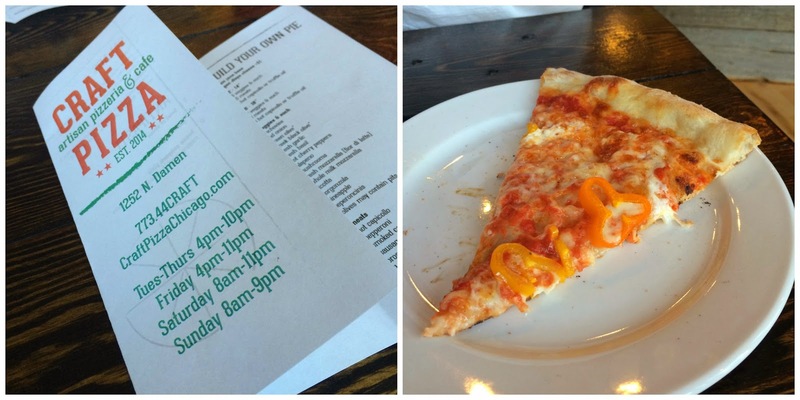 You can dine in or carry out at Craft Pizza and they're open for breakfast, lunch and dinner. At breakfast they'll be serving up homemade boiled and baked bagels and delicious Sparrow coffee. If you decide to dine in, bring a bottle of wine along because they are BYOB! Craft Pizza opens up to the public tomorrow Tuesday, June 3rd. Enjoy! Editor's Note: Our meal at Craft Pizza was complimentary, however the opinions expressed here are, as always, my own. mmmm yum! i need to try to visit before we move! xo jillian - cornflake dreams stop by! I'm hosting a giveaway. I bet you have a crazy long leaving Chicago bucket list! Yummy! That looks really delish! I should definitely try it out! Try the Bacon Bianco (since I didn't get to) and let me know what you think!! Wow, this piazza looks yummy. I loved to eat piazza. I used to visit Chicago with getbustours but I missed that one. But now I have noted down the address of this hotel and I must try it while go to Chicago with my friends for a picnic party. Looks amazing! Will have to try if I'm ever in Chicago. hong kong tour package That’s really a nice idea of improving one’s performance through travelling. Such a nice post and good research for work efficiency. Keep posting such inspirational blog.